The Milky Way Galaxy is our home galaxy in the universe. It is a fairly typical barred spiral with four major arms in its disk, at least one spur, and a newly discovered outer arm. In one calculation, the Milky Way has a mass of about 100 billion solar masses, so it is easiest to translate that to 100 billion stars. This accounts for the stars that would be bigger or smaller than our sun, and averages them out. Other mass estimates bring the number up to 400 billion. Since 2002, astronomers have been puzzled by a bizarre object at the Milky Way’s center that was believed to be a gas cloud headed toward our galaxy’s supermassive black hole, called Sagittarius A* (or Sgr A* for short). Our Milky Way galaxy of stars is so huge that even at the speed of light it would take 100,000 years to travel across it! It takes between 225 million and 250 million years for the Sun to orbit the Milky Way. 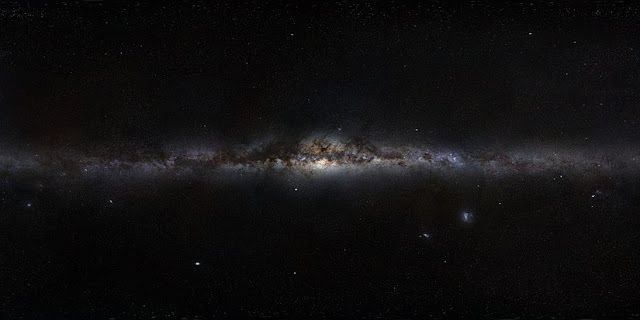 The Milky Way moves through space at a velocity of about 552 kilometers per second (343 miles per second) with respect to the Cosmic Microwave Background radiation. Our galaxy will collide with Andromeda Galaxy in about 5 billion years. Some astronomers refer to our two galaxy as a binary system of giant spirals. The Local Group is the galaxy group that includes the Milky Way. The Local Group comprises more than 54 galaxies, most of them dwarf galaxies. Its gravitational center is located somewhere between the Milky Way and the Andromeda Galaxy. The time it takes for the Sun to orbit the Milky Way one time is known as a Galactic Year. The Sun, Earth, and the rest of the solar system are located about 27,000 light-years away from the Milky Way’s Galactic Center, on the inner edge of a minor arm of the galaxy, named the Orion Arm. Until 1924, the Milky Way was the only known galaxy. The shape of the Milky Way was discovered by Edwin Hubble. In China, the Milky Way is called “The Silver River.” In ancient Chinese myth, the river was placed in the heavens by the gods trying to separate a weaver who made their clothes and the herdsman who loved her. The Romans called our galaxy the Milky Road because it reminded them of milk. The Greeks called it the Milky Circle. In fact, the word “galaxy” is from the Greek word for milk. In Greek mythology, the Milky Way was created when Hera spilled her milk while suckling Heracles. It was also described as the road to Mount Olympus, or the path of ruin made by the Helios’ (the sun god’s) chariot. The ancient Greek philosopher Democritus, who lived from about 460 to 370 B.C., was the first known person to suggest that the Milky Way is made of stars. Galileo Galilei (1564–1642) was the first to identify and resolve the band of light as many individual stars with his telescope in 1610. When a person sees the Milky Way at night, they are seeing only about 0.0000025% of the galaxy’s hundreds of billions of stars. The Milky Way began as a series of dense regions in the early universe not long after the Big Bang. The first stars to form were in globular clusters that still exist. They are among the oldest stars formed in the Milky Way region. The age of the Milky Way is a tricky question to answer, though, because we can say that the oldest stars are 13.4 billion years old but the galaxy as we know it today still had to form out of globular clusters and dwarf elliptical galaxies in an elegant gravitational dance. The Local Group itself is part of a larger gathering of galaxies called the Virgo Supercluster of galaxies. All galaxies are not alike, but most fit into one of three main groups: 1) spiral galaxies (such as the Milky Way), 2) elliptical galaxies, and 3) and irregular galaxies.